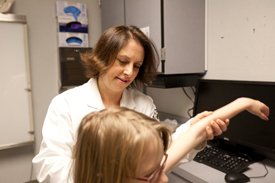 The treatment of children with orthopedic conditions requires a special expertise. 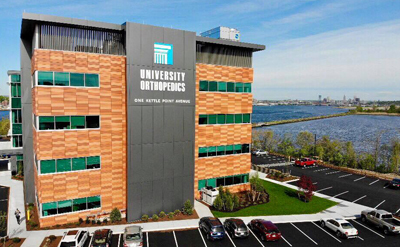 The division of pediatric orthopedics at University Orthopedics consists of three fellowship-trained surgeons who are committed to the care of the children of Southern New England. These orthopedic specialists have fellowship-training in pediatric orthopedics and years of experience specializing in the care of children and teens with orthopaedic problems. A fellowship is the highest level of medical education in the United States. A fellowship is designed to compress the knowledge and expertise that would otherwise be gained from years of experience in that specialty. Common conditions that we treat include broken bones, sports injuries in the young athlete, congenital disorders such as clubfeet or dislocated hips, and disorders of the spine such as scoliosis or kyphosis (“roundback”). We also treat patients with Cerebral Palsy, Spina Bifida, Muscular Dystrophy, and other neuromuscular disorders; we emphasize a “team approach” involving physical and occupational therapists and other physicians to provide comprehensive care. In addition to the non-operative management of musculoskeletal conditions, we perform surgery to correct many of these disorders. These procedures, all of which are performed at Hasbro Children’s Hospital, include fixing fractures, correcting curved spines, reconstructing limb deformities, performing arthroscopic surgery, and lengthening of short limbs. From the traditional to the cutting edge, all available treatment modalities are used to correct the full spectrum of orthopedic disorders in children. The members of our division are actively involved in the education of the next generation of orthopedists, and our fellowship has trained pediatric orthopedists around the country. We invite parents of children with orthopedic disorders or injuries to schedule an appointment with us. As the parent of an injured child or teen, consider that one of the most important decisions you will make for him or her is whom you choose as your child’s orthopedic doctor. This is because a child or teen is not always treated the same as an adult. Children and adolescent’s bones are still growing, their muscles are still developing, and their neuromuscular system remains incompletely developed up until early adulthood (early 20’s). Because of this, you should choose an orthopedic doctor that has the experience and training to treat children with orthopedic problems. Pediatric orthopedic surgeons specialize in the treatment of musculoskeletal, congenital and growth-related problems that are unique to children. They also specialize in treating acute injuries such as broken bones sustained on the playground or sports injuries sustained on the field. They are trained to respect children and adolescent’s developing musculoskeletal system and can utilize techniques that takes this into account. All kids and teens have growth plates in their bones. A growth plate is soft tissue that grows on the end of long bones that is eventually replaced with solid bone. A growth plate resembles a gap between the long bone and its head. During adolescence, these plates are replaced by bone. Girls' skeletons mature earlier than boys, therefore older boys are more likely to have a growth-plate injury than older girls. Growth plates are the weakest seams in a child's skeleton and are the most susceptible to injury. If not corrected, a growth-plate injury can stunt the growth of a bone, creating a situation in which one leg or arm is longer than the other. What injuries occur to growth plates? Because growth plates are weak, then can fracture. Ligaments surrounding a child's joint are not that strong and may not be able to fully stabilize a joint. A an injury or impact, such as twisting an ankle or knee, can cause an injury to the growth plate. More commonly, though is overuse syndrome from parents pushing kids too aggressively in their sport. For example, a baseball pitcher can do serious damage to his growth plate in his arm due to repetitive use and excessive throwing. That’s why most little league teams have strict limits on how many pitches or innings a young pitcher is allowed to throw. In most cases, it is not necessarily the nature of the sport that is dangerous, but the lack of safety and precautions that lead to injury. Some sports with higher rates of injury do not use or enforce the use of safety equipment. Many doctor visits are made each year due to injuries related to team and individual sports. However, you might be surprised at which sports were cited as the most dangerous. When kids play hard, they fall hard. Enough force applied to an outstretched arm can cause a fracture. According to the American Academy of Orthopaedic Surgeons, 10% of all fractures in children are elbow fractures. A child can fracture their elbow in several areas outline below. Above the elbow — (primarily occurs in children under the age of 8) When the upper arm bone breaks, it can cause nerve damage. At the elbow knob — These injuries can affect the growth plate of the humerus and joint surface. Below the elbow — Dislocation of the elbow can break off the tip of the radius (smallest forearm bone) or cause a compression fracture. Treating the fracture depends on its severity and location. The orthopedic surgeon may carefully move the bones back into alignment and apply a cast for 3 to 5 weeks. Some cases require surgery or immobilizing the fracture with pins. The AAOS reports that 40 - 50% of kids' fractures occur in the forearm. High energy, contact sports place kids at greater risk for forearm fractures. Falling with an outstretched arm can cause a fracture to one or both of the bones (ulna and radius) of the lower arm. If the area has any deformity, acute pain, tenderness, swelling or inability to rotate, you should see an orthopedic physician. According to AAOS, ankle sprains are one of the most common injuries in sports. Because the inner ankle is less stable, children's feet tend to turn inward after a tackle or collision on the field. Sports that involve a lot of running, jumping, physical contact and kicking pose the greatest risk for ankle injuries. The achilles tendon connects the heel to the lower leg. Injury is more likely when the calf muscles are tight, such as in football and running. Placing too much stress on the tendon created by the tightening of the calf muscle may cause it to strain or rupture. Long, vigorous training or improper technique can cause overuse injuries to your child's ankle. Stress fractures of the ankle and muscle/tendon strain can then develop. Clubfoot is an ankle disorder in which the feet of an infant are turned inward and under the leg. AAOS estimates that one in every 1,000 babies has clubfoot, and 2 of 3 of those are boys. Clubfoot is genetically linked and twice as likely to occur if a parent or sibling has clubfoot. Treatment should begin immediately after diagnosis. The earlier the cluboot is corrected the better the outcome. According to the AAOS, casting alone corrects clubfoot 50% of the time. Over a period of 6 to 12 weeks, a series of casts are used to slowly straighten the feet. Special shoes or braces keep the foot straight once corrected. In certain cases, your child may require surgery to correct the tendons. One of the most common pains in the adolescent or pre-adolescent children is anterior knee pain (pain in the front of the knee). It can be caused by a number of problems, and should be addressed by a pediatric orthopedic doctor who can evaluate all of the potential causes and be able to treat them without delay. Although adolescents can be large or tall, their bones and joints are still immature, and they must be treated with respect to the open growth plates (the areas around the knee that are still made of cartilage). Many of the causes of pain can be attributed to the adolescent growth spurt, usually occurring between the ages of 9 and 14. Many of these problems can be treated with therapy aimed at stretching and rebalancing the joints, without the need for surgery. Many are due to overuse, which can also be treated conservatively with a specialized pediatric sports rehab program, followed by incorporation of the trainer or coach into the return to sport. Scoliosis involves an abnormal curvature of the spine, in which the vertebrae twist like a bent corkscrew. The exact cause of scoliosis is unknown. As much as 1-4% percent of the population is reported to have this condition. Scoliosis is more common in females than males and most often affects adolescents between the ages of 10 and 18. At University Orthopedics, Dr. Craig Eberson is a fellowship-trained specialist with extensive experience in treating pediatric scoliosis. Scoliosis most often attacks adolescents between the ages of 10 and 18 and is more commonly seen in females than males. A child's likelihood to develop scoliosis is much higher if their parent or a sibling has it. Scoliosis can also develop over time in mid- to late childhood, usually before puberty. In other cases, the disease is congenital, meaning a person is born with a vertebral abnormality that causes it. When scoliosis develops in girls prior to their first menstrual cycle, it is more likely to progress. When the onset occurs after the first menstrual cycle, the progession of the scoliosis is likely to reach a stopping point. To diagnose a child with scoliosis, have them can touch their toes. If there is an imbalance in one or both shoulder blades, the waist or the ribs, scoliosis may be present. 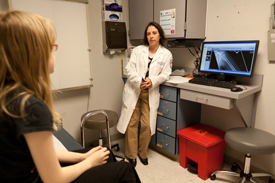 Pediatricians often screen for scoliosis, and there are school-screening programs as well. While not much is known about the cause of scoliosis, some experts theorize it may be genetically linked so it is a good idea to have your orthopedic specialist screen your child yearly for scoliosis, if he or she has a parent or sibling with the disorder. It can be unsettling if your child is diagnosed with scoliosis. Treatment options typically vary from case to case. Treatment referred to as "watchful waiting" is recommended when the condition is mild and does not seem to be worsening. If X-rays taken two to three times a year show no changes, no additional treatment is needed. In most cases of scoliosis, physical activity is encouraged since it helps to strengthen muscles and ligaments surround the spine and increases flexibility. Formal physical therapy may be prescribed to some adolescents with scoliosis. If scoliosis seems to be getting progressively worse, a brace may be prescribed. The brace is worn either at night or during most of the day until the child stops growing. In severe cases where the spine curves into the internal organs such as the lungs and the heart, or if the deformity is so large the health of the spine is at risk, surgery may be necessary. If the curve is worsening it can damage internal organs. The pediatric scoliosis surgeon may recommend a surgery that “de-rotates” the curve in the spine, effectively straightening it permanently. Thanks to advances in scoliosis surgery, new techniques enable the trained scoliosis expert to access the spine through several small incisions to attach surgical instruments and fixation rods that correct the curve. This is called minimally invasive scoliosis surgery.